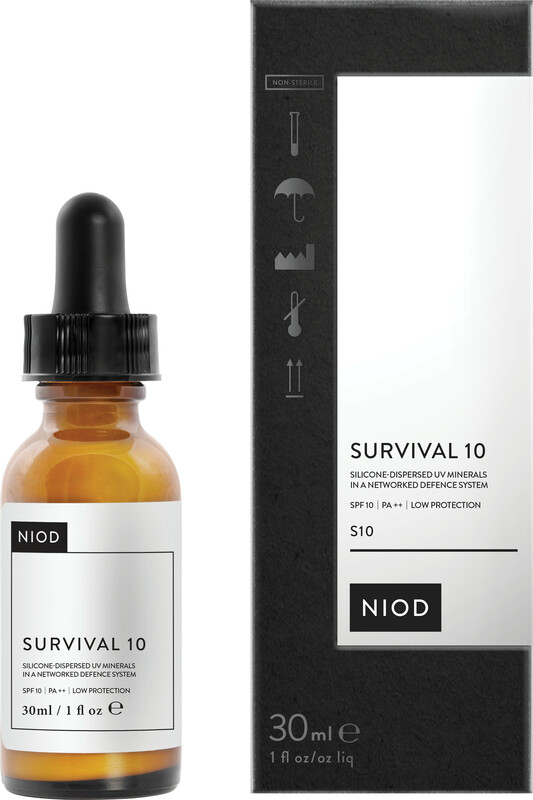 Start the day by protecting your skin from harmful UV rays with NIOD Survival 10, a SPF10 skin protectant serum designed for darker skin tones. External aggressors can have a huge effect on our health, especially that of our skin – which is why NIOD Survival 10 should be a part of your daily skincare ritual. The lightweight formula is designed to strengthen the skin’s defense system, working to protect it against pollution and UV rays without the use of skin-irritating chemical sun-blocking agents that can lead to further oxidative stress. The innovative Survival 10 formula offers protection with physical sun filters, made up of a dispersion of zinc and titanium dioxide that reflect and absorb light. This helps to keep the complexion youthful for longer, while shielding it against photo-damage. Apply to your face prior to sun exposure, either under or over makeup. When UV exposure is prolonged, reapply every 2 hours or after towel-drying, perspiring or swimming. Alcohol-free, paraben-free, sulphate-free, mineral oil-free, nut-free, gluten-free.